Seared Salmon with Pea Pesto and Celery Root Puree | "blackberry-eating in late September"
If you are a certain type of food blogger, one who is interested in trends of the food and restaurant world, not just the backdrop and vintage props Pinterest tells us are all the rage this month, then you care about and try to integrate sustainability, and seasonality, and local foods into your cooking. You are all about ramps and rhubarb in the spring, you plan zucchini dishes for late summer and early autumn when that crop is glutted. You wouldn’t dream of presenting a heavy stew or cream-based soup unless the weather has been cold. You let the year and its turning rule your kitchen. I try to be that kind of blogger. I try to keep my food in tune with the seasons and plan vegetable dishes according not just to what appears at my farmers’ market, but to be sensitive to the fact that not everyone is in Southern California, so not everyone has the same plethora of options I do. I even try to plan for holidays, and get appropriate dishes out there ahead of time (sometimes barely) in case you want to make them. Sometimes it works, sometimes it doesn’t. But here’s the thing: I’m also ruled by my stomach. Sometimes I don’t want zucchini. Sometimes I would rather roast than grill. Sometimes there’s a combination I dream up that sounds so good I don’t want to wait until the “right” time to cook it and present it to you. That’s the case this week. This is, if I were being a responsible food person, without question a spring dish. The peas could be fresh out of the pod, the dill is all about feathery fronds and new shoots. 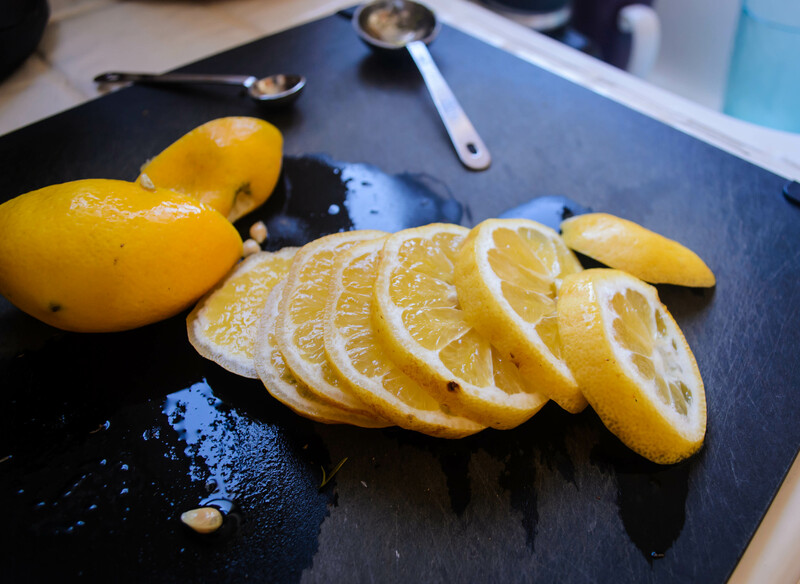 I cook the salmon so the skin is crispy, then balance the flesh side atop lemon slices in the pan to keep it moist and tender, all freshness and brightness. The celery roots, on the other hand, are the last dregs of winter, knobbly and earthy and strange, adding pale richness to complement the salmon and tame the sprightly sharpness of the pesto. But when I thought of it – a nutty pesto of peas and walnuts, seasoned with dill instead of basil or mint and almost on the verge of being too salty, sitting atop a piece of moist, pink salmon with crisp skin, all surrounded by the creamy celery-scented puree, I couldn’t wait half a year. It had to happen now. There’s not much to say about this dish, story-wise. No childhood memory or restaurant meal inspired it. I just thought the combination sounded good, and it was. The pesto, in particular, though admittedly not the most appealing shade of green, is a surprising and intriguing punch. Dill works very well with peas as well as lemon, and the tannic bitterness of toasted walnuts tames the sweetness of the peas enough to keep them in the savory realm. Note: the puree does take the longest time to create, since the starchy roots can take up to half an hour to soften. If you’re very efficient, you’ll be able to prep the remainder of the components while the hunks of celery root are simmering. I am not all that efficient, so I made the pesto first just in case. You know you best, so plan accordingly. To make the celery root puree, place the chunks of chopped celery root in a medium pot and pour in enough milk just to cover. Add salt and pepper and toss in the garlic clove. 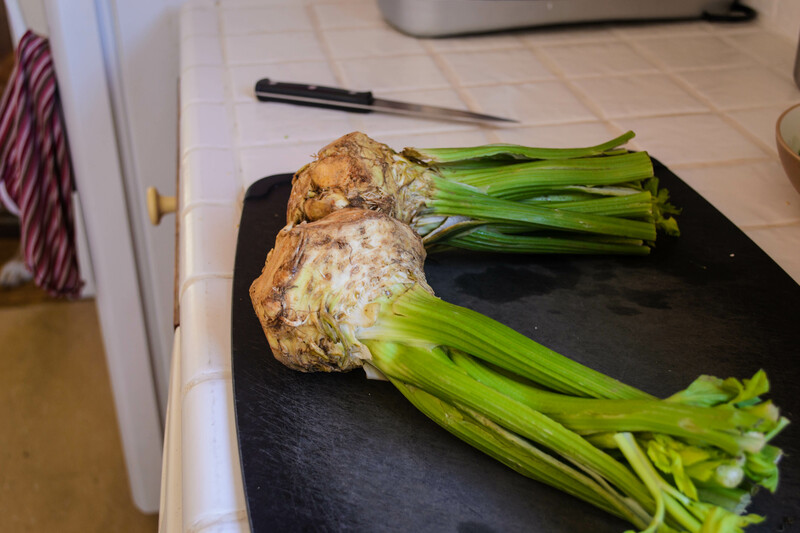 Bring to a boil over medium-high heat, then immediately turn down the heat, and cook at a bare simmer until celery root pieces are fork tender, 20-30 minutes. Once roots are tender, remove the pot from the heat, add the mascarpone cheese, and let sit for 5-10 minutes just to cool. Use an immersion blender or a regular blender (be VERY careful with the hot liquid) to blend to a smooth puree. While the celery root chunks are simmering, remove the salmon from the fridge and its packaging and sprinkle it with the ½ teaspoon salt and ¼ teaspoon pepper. Then set it aside. We want it to come up to room temperature so it cooks evenly. To make the pea pesto, either blanch your fresh peas by dropping them into boiling water for 1-2 minutes before a quick drain, or defrost your peas if they are frozen. Toast the walnut pieces in a dry pan just until they smell roasty and are slightly darker brown. Let them cool, then toss them into a food processor with the garlic and whir these together into damp crumbs. Add in the dill and whir again to break up the fronds. Dump the cooled peas into the processor and pulse at 2-second intervals 3-4 times to create a chunky, clumpy mixture that is not quite a paste. Finally, add the lemon juice, salt, pepper, and olive oil, and pulse again in 2-second intervals until you have a thick, barely emulsified paste. You want this to be spoonable, not pourable, so keep your eye on the texture. When you are ready to cook the salmon, heat 2 tablespoons of olive oil in a large skillet over medium heat until the oil is rippling and shimmering in the heat. Carefully add the salmon skin-side down (oil will likely spatter a bit in excitement when you do, so stand back! ), and let it cook undisturbed for 5 minutes. Really! Don’t mess with it! After 5 minutes, top each salmon piece with 2-3 lemon slices and carefully flip over so that the lemon slices, not the flesh of the salmon, are in contact with the pan. Again, this may cause some spattering of the oil, so be careful. Let the salmon cook atop the lemon slices for another 2-3 minutes, or until just done in the center. To serve, pour ⅓–½ cup celery root puree into the base of a small plate or a shallow bowl. 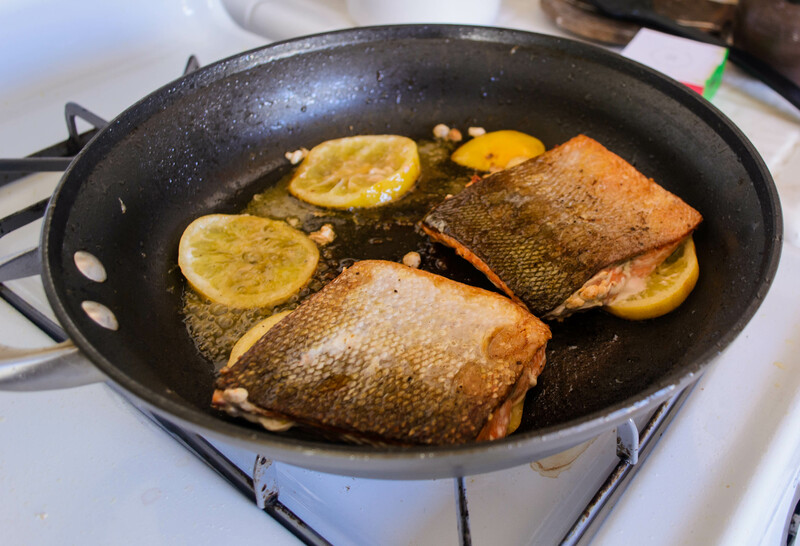 Place a piece of salmon skin-side up atop in the center of the pool of puree (leave the lemon slices in the skillet, or serve one off to the side if desired). Top the salmon with 1-2 tablespoons of the pea pesto, and serve immediately. 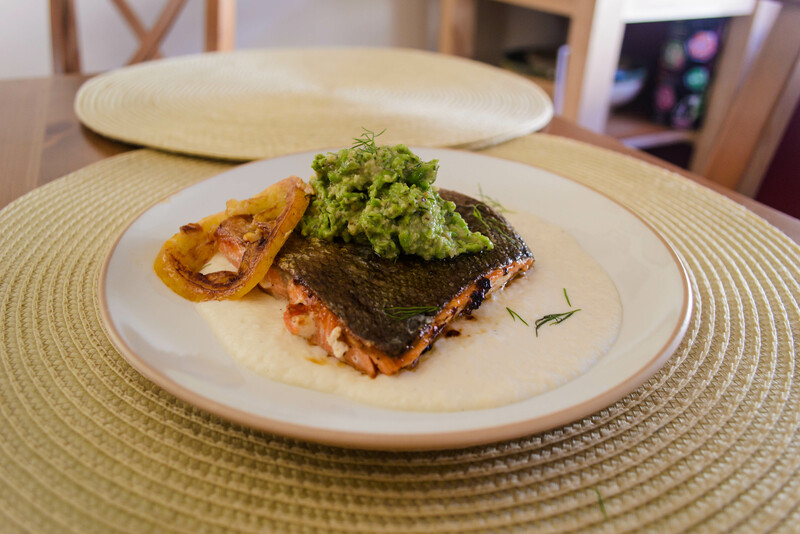 This entry was posted in fish, Gluten-free, Recipes, roots, Veggies and tagged celery root, peas, pesto, salmon by Chelsea. Bookmark the permalink.